Dawson Marcum of Durango High School reaches across the gaol line for a touchdown during the Pueblo Centennial game two weeks ago. Marcum is only 54 yards away from a 1,000-yard rushing season. He has averaged 135 rushing yards per game this season. It won’t be the same Pueblo South team that won a Class 4A state championship a year ago when the Colts ride into Durango High School for a key South Central League football game Friday night. The Colts, who moved down into Class 3A after last year’s state title run in 4A, graduated the bulk of last year’s team, but the seventh-ranked Demons will still be ready for a tough game against another physical Pueblo-based team. Durango (5-2, 2-0 3A South Central League) will host Pueblo South (2-5, 1-1 SCL) at 6 p.m. Friday. 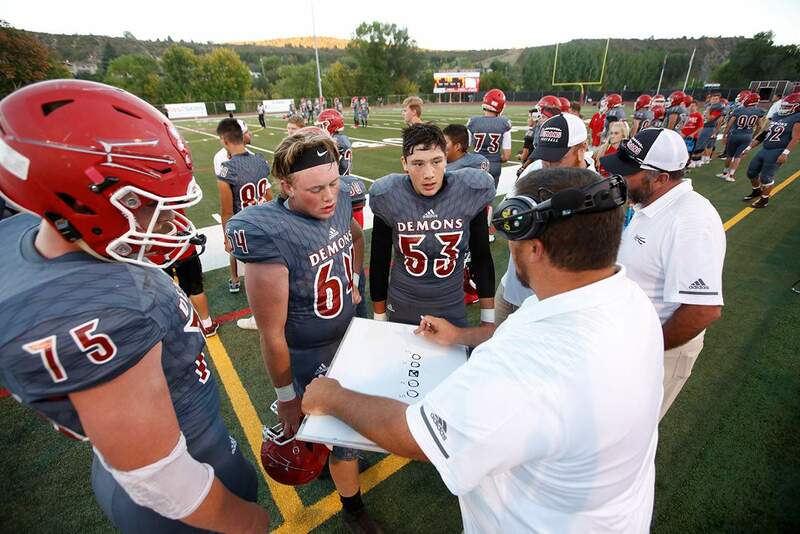 The Demons will hope to win their final two home games in the next two weeks to set up a potential league championship game Nov. 2 at Pueblo East. DHS senior Dawson Marcum has been a force in every phase of the game this season. He has a chance to crack the 1,000-yard rushing barrier Friday night, as he will enter the game with 946 yards on 105 carries. He has rushed for more than 100 yards in six of the team’s seven games this season, and he has 10 rushing touchdowns. Marcum also has thrown for a touchdown and been a force returning the ball on special teams. 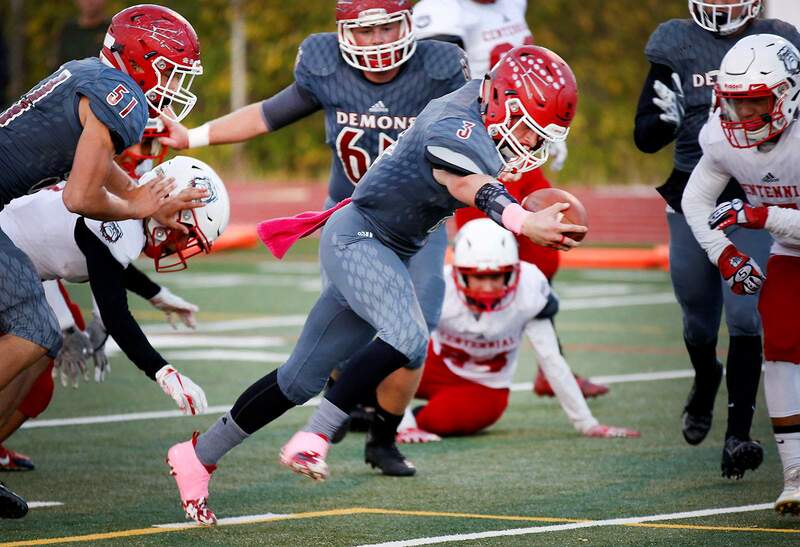 He also has led the Demons defensively with 72 total tackles and two interceptions. The Durango High School coaching staff has had the players ready to go during a tough schedule this season. Marcum and the DHS defensive backs will also look for opportunities to score on defense this week. Pueblo South junior quarterback Logan Petit has thrown eight interceptions to 10 touchdowns this year. He has thrown for 1,158 yards while he has completed 48.5 percent of his passes. Vogt said the Durango defense has had a great week in practice to prepare for Pueblo South’s pass game. DHS will have to be careful of Colts wide receiver Jackson Dickerson, who has 557 receiving yards and four touchdowns on 34 receptions. Senior Cedric Tillman also has four receiving touchdowns to go with 349 yards on 30 receptions. Vogt said the DHS offense will have to be wary of Pueblo South linebacker Braden Christie, too. “I’ve never seen a kid go as fast or hard as he does,” Vogt said. Durango’s pass attack has been on target in league play so far. Woolverton is up to 1,081 yards passing to go with eight touchdowns to only two interceptions. He has completed 65.5 percent of his passes and has hit eight different receivers this year. DHS will look to keep it up on a slippery turf field that is sure to be extra slick with all the rain in Durango the last week.